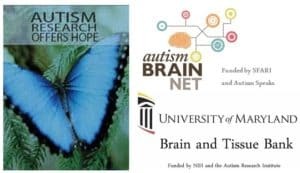 Brain and tissue banks serve the critical purpose of collecting, preserving and distributing tissue to qualified scientific investigators who are dedicated to the improved understanding of autism spectrum disorders and the development of effective treatments. Donated tissue may provide key information necessary to help the thousands of children who suffer with this devastating disorder. Tissue donation is accepted by most major religions. All costs incurred by the donation are covered by the tissue bank. The procedure to recover tissue does not interfere with a traditional funeral service.